For me, warm weather mean patio dining, and Salt Lake City has some notable restaurants with lush al fresco spaces for their patrons, but one that stands out is Trio. It’s just a couple blocks from my house, so I’m a bit of a regular and in the summer months the patio can be the perfect spot for long, drawn-out meals with friends under tinkling bulbs with a couple bottles of wine. For me, warm weather means patio dining and Salt Lake City has some notable restaurants with lush al fresco spaces for their patrons. One that stands out for me is Cafe Trio. It’s just a couple blocks from my house, so I’m a bit of a regular and in the summer months the patio can be the perfect spot for long, drawn-out meals with friends under twinkling bulbs with a couple bottles of wine. I was nervous about Trio a couple years ago when some of the longtime — and beautiful — servers had moved elsewhere (I’m talking to you Xan – wherever you are). They also lost Joshua Pace, Meredith, Nikki, Princess and others who imbued the place with familiarity and heart. The food was the same, but the friendly, knowing-your-drink and favorite entrée had passed. Perhaps an accountant had noticed too many free drinks, or maybe a “consultant” was brought in to help manage the growing businesses (the owners also own Fresco Italian Café on 15th & 15th and Café Trio in Cottonwood). Whatever happened, I can tell you they are back on track. Nikki and Casey are back, heading the front of the house with a smile and knowledge of which no owner should ever let go. It was too cold on my recent visits to enjoy the patio, so we sat inside and I noticed how the hip interior has held up so well for over a decade. The bright colors and white tablecloths make Trio modern and sophisticated while the exposed brick puts anyone in a comfortable mood. Being a really “good” drinker (I’ll let you decipher what “good” means), I started with a wonderful High West Whiskey cocktail, it was a special served in a cute little Ball jam jar with a paper-thin lemon-slice garnish that had been lightly grilled. It was a perfect aperitif — maybe too perfect as I don’t recall the exact ingredients or the name — perfect beginning! 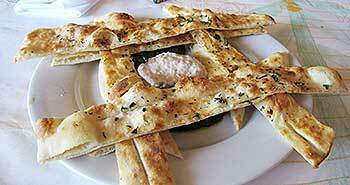 I usually don’t do apps, but the rosemary flatbread is truly addictive. The flatbread is served warm, fresh out of their pizza oven in a ceramic bowl with a hearty pile of sweet caramelized onions, roasted tomatoes and peppers and a creamy goat cheese. It’s sinful, and could be a meal in itself, if you didn’t want to share. In the summer, on the patio, the antipasto plate is a great place to start the munching over cured meats, olives, local and Italian cheeses and more flatbread. When Trio opened they received a lot of press about their wine list, which is organized by price instead of varietal or region. The wines have steadily been improving and feature wines from Italy and the northwest. My meal would not have been the same without a glass of the Cha Cha, a Grenache from Spain. It was delightful and perfect with the baked penne. OK, baked penne, not the most ambitious item for a food review, and trust me, I’ve had everything on the menu, but if you’re new to Trio, this is a must. It’s like you’re in an Italian grandmother’s kitchen. The dish is thick, rich and hearty — gran biscotto ham, mushrooms and oven-roasted tomatoes, all basking in a garlic cream sauce. You’re going to take enough home for two more servings – it’s that big, and even better the next day. A few other must-tries are the chopped salad — fresh and light with pistachios, greens, cucumbers and feta topped with perfectly roasted beets. Make a point to listen to the fish special, it’s never let me down and generally some of the best cooked fish I’ve had in the city. Trio’s fab flame is burning brighter than ever and if it’s been a while, you should go back, the patio is open!